It’s like a S’more. Only built like a nacho. Oh yeah, and it has caramel. And fudge. And you don’t hold it on a stick over a fire. I’d love to say this idea was mine, but it wasn’t. Original idea belongs to George Duran. I saw the title on his website and decided to run with it. Mine are constructed different than his. I didn’t check out his recipe until after I made them. He uses chocolate bars and constructs them in a skillet. I have a huge love for peanut butter. And chocolate. The idea for this little snack popped into my mind one day and oh, what a wonderful idea it was. The peanut butter gets all warm in the oven, providing the perfect spot for the toasted marshmallow to sit it’s gooey bottom. Sorry for that visual, but it couldn’t be helped. Don’t you just love a dish that tastes amazingly delicious, but is super simple? Toasted marshmallows don’t have to be eaten only at bonfires. They pair up wonderfully with cinnamon apple sauce. 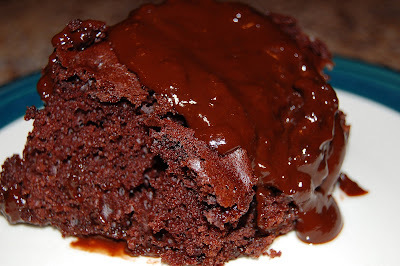 Chocolate cake that bakes with its own pudding – what more can you ask for? It had been ages since I had this cake. Mom used to make it when I was little. Sometimes I requested it for my birthday. 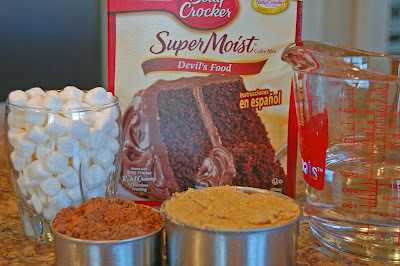 Last weekend, we dug around in Mom’s recipe box until we found the instructions for this cake. 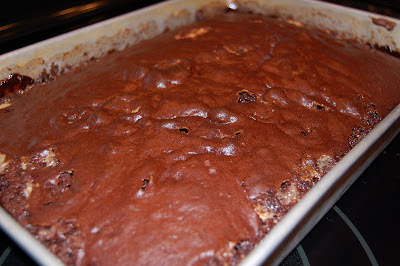 In a 13×9 pan, mix the brown sugar and cocoa together. Stir in 2 cups of water. 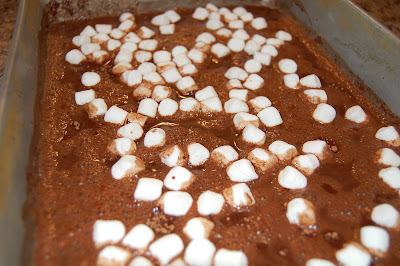 Scatter the marshmallows over the top. 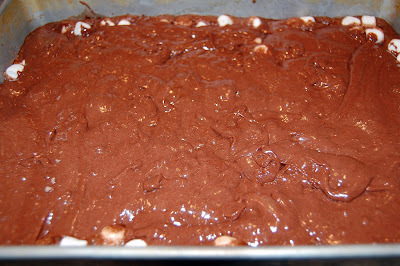 Mix up the cake batter and spoon it over the top of the mixture in the pan. Be careful transferring the pan to the oven. It is very sloshy with all that water in the bottom. Bake at 350 degrees for 45-50 min. Serve it warm with whipped cream or ice cream if you like. 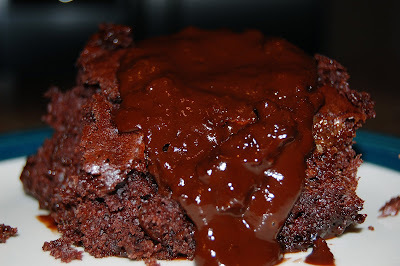 The pudding is on the bottom and I just drizzled it over the top of the pieces as I spooned them out of the pan. The cake didn’t even last 24 hours and I only ate one piece! I better make another one soon.